Intern Channa Lloyd during the George Zimmerman trial on July 3, 2013 in Sanford, Fla.
Next week, black attorneys will gather in Miami, Fla. for the 88th Annual National Bar Association Conference, where Trayvon Martin’s mother, Sabrina Fulton, and her attorney, Benjamin Crump, are scheduled to appear at a candlelight vigil. 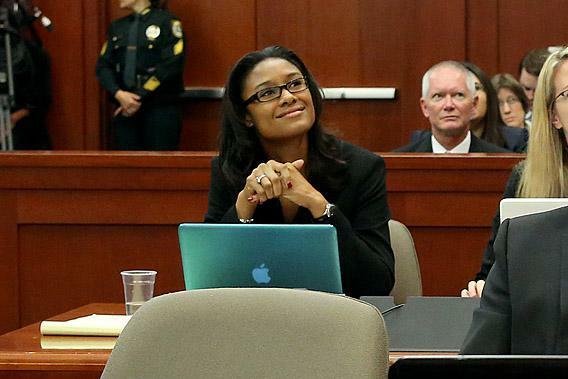 Also attending is Channa Lloyd, the black intern who volunteered for George Zimmerman’s legal team. Shortly after Zimmerman was acquitted of murdering Martin, CNN aired an interview with Lloyd, who is a law student at Barry University. Asked if she thought Zimmerman was a racist, Lloyd said no, and implied that she’d have a difficult time working for a client who was. This speaks to her naiveté. The job of a defense attorney isn’t to assess a client’s prejudices (or guilt). It is to defend her client. That goes for clients accused of racism, too. Cherry-picking who is worthy of representation is a dicey proposition for any attorney, let alone a black one. Some of the country’s most revered black attorneys are believed to have represented persons guilty of abominable crimes, yet the black community has supported them. For example, Billy Martin, who came to national prominence as Monica Lewinsky’s attorney and now serves as president of Washington, D.C.’s black bar association, represented NFL quarterback Michael Vick, who went to prison for dog-fighting charges, and former NBA star Jayson Williams, who pled guilty to manslaughter in the shooting death of his limousine driver. We should give the same support to those defending accused racists. Paula Deen, who lost TV and book deals after her history of using racial slurs and revering the antebellum South was revealed, has hired Grace Speights, a partner at Morgan, Lewis & Bockius. Speights, who has been featured in Black Enterprise Magazine, is one of the nation’s best-known black female labor and employment defense attorneys. Another is Michele Roberts, who was depicted in the book The Good Black in her role as lead defense counsel for a law firm sued for racial discrimination by a black Harvard Law graduate. Ten years later, Roberts again successfully defended a law firm against charges of race discrimination—in a case that I brought. In 2009, I filed a lawsuit alleging discrimination and retaliation against my former law firm, Covington & Burling. Roberts represented Covington. During the three-year ordeal, which included weeks of grueling depositions, more than one black attorney expressed to me disappointment in Roberts for taking the case. I knew it wasn’t that simple. Roberts had begun her career in the D.C. Public Defender’s office under the influence of Harvard Law civil rights professor Charles Ogletree Jr. She later joined him to work with law professor Anita Hill during Justice Clarence Thomas’ confirmation hearings. Roberts currently sits on the board of Gideon’s Promise, an organization exalted in the HBO documentary, Gideon’s Army, which follows three public defenders as they work to defend those who can’t afford legal representation. In the documentary, black public defender Brandy Alexander, confesses that she knows most of her clients are guilty of the crimes for which they face prosecution. Why should it be noble to defend a murderer who was motivated by crime, anger, or no good reason, but treasonous to defend those motivated by racism? It is doubtful that workplace discrimination or racially charged crimes would end if black people stopped defending those accused. The only likely outcome would be even fewer black attorneys working in large law firms, where it’s quite common for them to head labor and employment practices. Perhaps there would be more sympathy for Channa Lloyd if it were clear what she’s up against. According to employment figures released by the American Bar Association for the law school class of 2012 , only 55.1 percent of 2012 law school graduates are working in full-time, long-term lawyer jobs not funded by their schools. There are no separate stats for black graduates, but they’re likely worse. Lloyd has an added barrier to employment as a graduate of Barry, which is in the bottom tier of the U.S. News & World Report rankings. According to the American Bar Association, only 52 percent of 2012 graduates from her school, had full-time jobs requiring a legal license. Twenty-nine percent were unemployed or of unknown status. Barry’s tuition, meanwhile, is $34,300 a year. Considering her likely law school debt, Lloyd’s decision to volunteer for Zimmerman’s defense attorneys is not only understandable, it’s downright inspired. Lloyd is right to do anything short of murder to increase her chances of getting a job in the law.